Why should I sell on Skymart? Skymartbw is the leader in e-commerce in the region with maximum online reach and highest credibility. With more than 5000 registered customers and 300 shipments every month to over 100 cities, towns and villages, we are the strongest partner to take your products to customers all over Southern Africa. Countries include Botswana, South Africa, Lesotho, Swaziland, Namibia, Zimbabwe and Zambia. Who can sell on Skymart? Anyone selling new and genuine products is welcome. You can be any of the following: Manufacturer, Wholesaler, Distributor, Retailer. There are few exceptions to the rule for which you may contact us. How do I sell on Skymart? List your products under specific product categories on the skymart marketplace. Customer sees your product and makes a purchase. You will receive an email to ship the product. Once an order is received, pack the product and contact us for collection. Our logistics partner will pick up the product and deliver it to the customer. Once an order is successfully dispatched, Skymartbw will settle your payment within 1-7 business days. You don’t need a website to start selling on Skymart. All you would have to do is list your products on Skymart and start selling. Can I offer both products and services on Skymart? 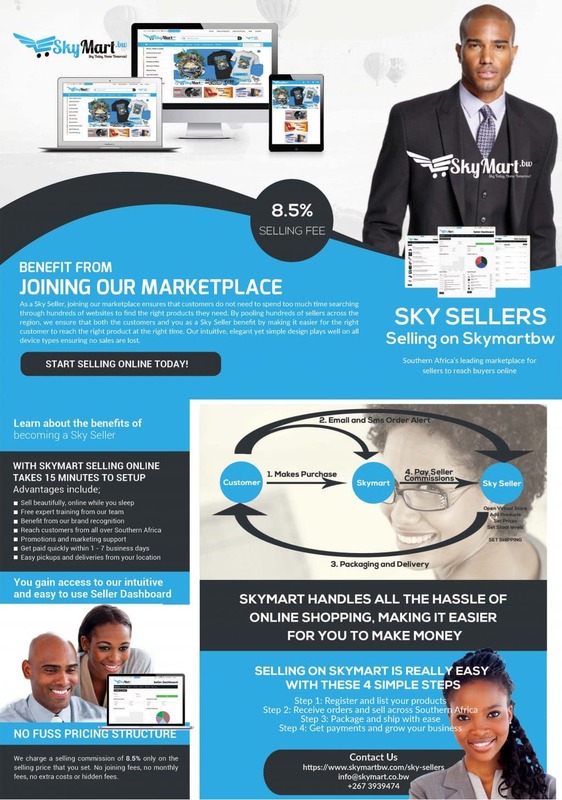 Currently, you can sell only products and not services on Skymartbw. Do I need to courier my products to Skymart? Skymartbw will handle shipping of your products using our own shipping rates. All you need to do is pack the product and keep it ready for dispatch. Our logistics partner will pick up the product from you and deliver it to the customer. You can use your own preferred logistics partner to courier products to your customers however you would have to set the shipping rates for your products. What are the documents required to register as a seller on Skymart? Will I get charged for listing products on Skymart? No. Listing of products on skymartbw.com is absolutely free. Skymart does not charge anything for listing your catalog online. You only pay a small commission for what you sell. Using our own rates, our logistics partner will pick up the product from you and deliver it to the customer. All you need to do is keep it packed and ready for dispatch. Alternatively you can arrange your own delivery methods by setting delivery rates for your own products. After all the required documents have been verified and your virtual store is complete, you can start listing your products and start selling. You can start with even one listing and gradually increase number of listings. What is the guarantee that I will get business? Skymart sells 200-500 products per month and as per our analysis, sellers with good variety of products have more chances of sale. Can I sell outside Botswana through Skymart? What is selling commission and how much commission is charged? Selling commission is a certain percentage of the selling price of your product. The commission rate is 8.5% of the total price set by the seller. Please give an example to show the cost calculation. All payments are made through EFT transactions (online banking) or Cheque. With EFT the payment is made directly to your bank account within 1-7 business days of delivering an order. With Cheque payment we will send out your cheque with our logistics partners to you within 1 – 7 business days of delivering an order. You can even start with one listing and gradually increase your number of listings. How do I list my products on Skymart? We give you a step-by-step process of how to list your products on our website. It is important to choose the most suitable category to list your product as it will help customers find your products faster. Based on the category you choose, you’ll be asked to include product details such as size, model, color, etc. Yes, we are happy to help you at every stage while doing business with us. We help you connect with industry experts for the development of your catalogs. With the help of our catalog partners, you can have attractive images and crisp content developed at unbeatable prices. To get you started quickly we will help you add the first ten (10) products for free. There after we charge P50 (USD5) per product, this includes professional photo shoots and content creation. When pricing products on Skynart, please account for the applicable Selling Commission of 8.5% and include a suitable margin to arrive at the Selling Price. No. Listing of products on skymartbw.com is absolutely free. Skymart does not charge anything to you for listing your catalogue online. You only pay a small commission for what you sell. Can i set stock levels of my products? Yes you can set the stock levels of your products in your virtual store. Can i integrate our internal inventory management system with that of skymart? No, we do not provide systems integration. You have to manually set stock levels on Skymart. and reduce where appropriate. Can i bulk import my products from my website to my virtual store on skymart? Yes we can help facilitate bulk imports using the CSV file format on a case by case basis. Please contact us for more information. How do I manage my orders on Skymart? Through our vendor dashboard, we make it really easy for you to manage your orders. Whenever a customer places an order, we send you an e-mail alert. You need to pack the order and keep it ready for dispatch within the time frame provided by you in your shipping policy. Please alert our team to arrange a pickup of the package by our logistics partners. Be sure to make the driver sign the delivery note before handing the package over to him. Does Skymart provide packaging material? We do not provide packaging material. It is your responsibility to ensure that you package each order well with enough insulation to protect the contents of the package during transit. We do provide branding stickers to beautify your packages which are provided to you for free. Our team handles all customer returns adhering to the returns policy you have set out in your vendor dashboard. What protection does Skymart offer in case of lost/damaged goods and fraudulent customer claims? Skymart is in the process of setting up a Seller Protection Fund (SPF) to protect our sellers against fraud. You will be able to request for SPF claim through the vendor dashboard. When the buyer or logistics partner is at fault, you will receive due compensation. Yes in the future you can raise a claim through Seller Protection Fund. Depending on the case and category, you will be given a refund provided you have adequate proof that you shipped an authentic/undamaged product. This will help us close the dispute in your favour. Yes, in the future you can raise a claim through Seller Protection Fund. Depending on the case and category, you will be given a refund provided you have adequate proof that you shipped the right product. This will help us close the dispute in your favour. Yes. When your products are damaged in transit, we will help you raise a claim with our logistic partners. Get your store online at no costs. Maintain your brand identity while selling to a wider niche market.